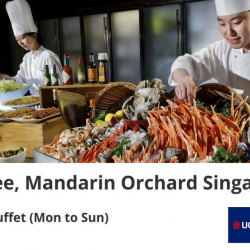 Till 31 Mar 2018 Triple Three @Mandarin Orchard: Enjoy 1-for-1 Buffet Lunch with UOB or DBS/POSB Cards! Japanese-inspired Triple Three boasts an extensive international buffet selection daily, featuring fresh sashimi and sushi, seafood on ice, live cooking stations, a premium roast section and delectable desserts. On Sundays, laze the day away while sipping on sparkling wine and indulging in freshly shucked oysters, while the young ones are entertained at the Kids' Corner. From now till 31 March 2018, enjoy 1-for-1 buffet lunch for adults when payment is made using a DBS/POSB/UOB credit or debit card (maximum 8 diners per card)! Book by 8 Jan 2017 Mandarin Orchard: New Year Flash Sale Staycation from just SGD 201.70++ Per Night! HAPPY NEW YEAR! Welcome 2017 with an unbelievable room deal! 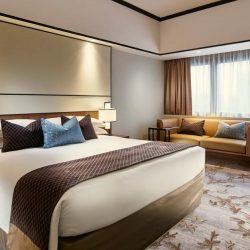 Book by 8 Jan and enjoy Mandarin Orchard's Deluxe rooms at only $201.7++ per night and top up $20.17++ to include breakfast for 2. What's more, get a free upgrade to their Superior Deluxe Room. The cherry on top? First 250 bookings get to experience the world's largest public display of modern Southeast Asian art at the National Gallery for free! Experience Singapore during the festive season and take advantage of this limited time offer. Stay in the heart of Orchard Road – Singapore’s most famous shopping and entertainment district – from just SGD 199++/night (Deluxe Room). Enjoy special rates at Mandarin Orchard when you stay from now until 31 January 2017. What’s more, book their Premier room at $249 and only top up $1 to include breakfast! Hurry, as this deal ends 20 November, 11.59pm! Enjoy the convenience of having iconic shopping malls such as Mandarin Gallery, Takashimaya, Paragon, Wisma Atria, Ion and Tangs right at your doorstep. T&Cs and black-out dates apply. Experience Singapore during the festive season and take advantage of this limited time offer. 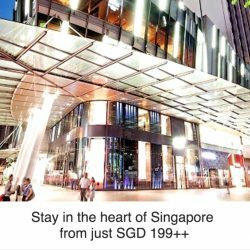 Stay in the heart of Orchard Road – Singapore’s most famous shopping and entertainment district – from just SGD 199++/night. Terms and conditions apply. For weekend stays on Fridays, Saturdays and Sundays until 5 February 2017. 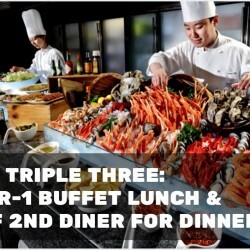 Enjoy 1-for-1 buffet lunch at Triple Three, Mandarin Orchard when payment is made using a DBS/POSB credit card (up to 8 diners per card) from Monday to Sunday! If you prefer dinner, every 2nd adult gets 50% off for UOB cards! Check below for the pricing. Promo is valid till 30 June 2016. Thinking of where to eat for your Christmas celebration? 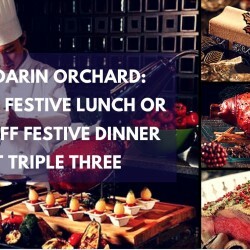 Try Triple Three at Mandarin Orchard Hotel with their lavish Christmas and New Year buffet spreads! If you book and pay before 16 December 2015 for Christmas, you can enjoy 1-for-1 Lunch or 25% off dinner buffets! Same goes for the New Year's Buffet, book and pay before 28 December 2015 to enjoy the same promotions. You can also consider IKEA's Swedish Christmas Buffet, more info here. 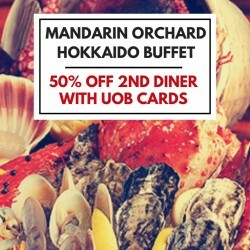 21 Oct to 1 Nov 2015 Mandarin Orchard: 50% OFF 2nd Diner for Hokkaido Buffet For UOB Cardmembers! From 21 October to 1 November for dinner and Sunday lunch, embark on an authentic Hokkaido culinary adventure at Triple Three. In addition to the freshest seafood such as yellowtail tuna, scallop and king crab, the buffet selection also features Japanese wagyu beef, ramen stations and a sensational array of Hokkaido desserts. UOB credit cardmembers enjoy 50% every second diner (maximum 8 diners)!